Welcome to the site that could change your life. "Un sueno hecho realidad" translates into 'a dream come true' which is exactly what the cave house is. Two long held dreams of mine have been to own a house in Spain, and to teach the deep allowing form of healing I have practiced for many years through courses, retreats and workshops. In a surprising way I was guided to this unusual house in a beautiful little known area of Andalucia. Its unique location and energy make it the perfect place for healing retreats and complementary therapy. Healing retreats include complementary therapy treatments including Reiki, Massage, Craniosacral, Indian Head Massage and Ilahinoor. Un sueno hecho realidad is situated in La Teja, a small rural village in Andalucia in the province of Granada, about one and a half hours drive north east from the city of Granada, the home of the Alhambra palace and gardens. A little about the cave. The cave house is about 300 years old and is actually dug out of the hillside. It sounds a bit iffy but it is a wonderful place to be. Until recently many people in this region lived in caves and dug out as many rooms as they needed for themselves and their animals. Yes.... they used to keep their animals in the cave with them at night! My cave had a donkey stall with three feeding troughs cut out of the stone, a place to keep a couple of goats, and a chicken run in the back of the cave. These rooms I have now refurbished as another sitting room, bedroom and store room. 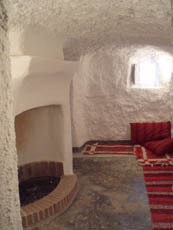 Caves were used because they were and are an inexpensive dwelling. Being in living rock (impermeable clay) the temperature is constantly between 18 and 22 degrees C so that when it is very hot outside, the cave is cool, and when it is cold outside the cave is warm. It's just like the cave having its own air conditioning and central heating system. However rustic the cave is on the outside, on the inside it is a very comfortable blend of modern and traditional with an open fire, two wood burning stoves, a built in bbq in the kitchen and a lovely whirlpool bath in a large luxurious bath room. Also the usual fridge, freezer, washing machine and dishwasher to make life easy. A tumble dryer is not needed because washing dries very quickly outside. Because of where and what it is, and the feeling it has about it, it is an ideal place to be for a 'get away from it all' holiday or a real healing retreat in Spain. Ideal for complementary therapy. It is now available for holiday rental for short breaks or longer stays and is equiped for self catering holiday accomodation. 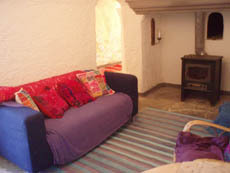 The snug area, pictured here, is a lovely warm and cosy place to be. In the evenings if you don't want to sit outside you can cuddle up on soft comfortable cushions in front of an open fire and dream. You can walk among the hills and take in the breathtaking views, pick wild herbs to use in your cooking or just explore the village. This is truly an unspoilt part of Spain. 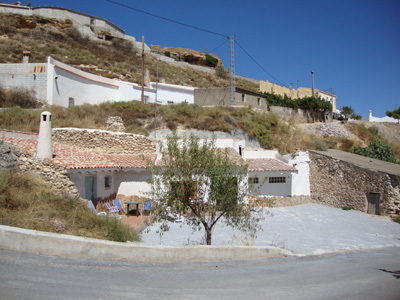 Neighbouring villages are about 10-15 minutes scenic drive away, and Baza, the largest town about 30 minutes, and each have their own unique character.